A warm friendly welcome in a homely peaceful atmosphere one and a half miles from Holt. 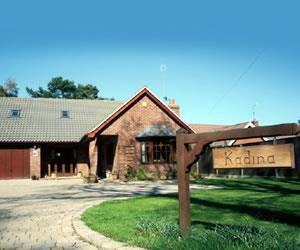 Kadina is a modern, spacious chalet bungalow tucked away in the wooded village of High Kelling. Ideally situated for bird watching, walking and cycling. Holt steam railway station within walking distance. Close to Greshams School, 4 miles from Blakeney and coast. Open all year. Evening meals available Monday to Friday. Leisure Club with indoor pool, 2 miles. Cycle Hire available locally. Pubs and Restaurants in Holt approx 1.5 miles. Children welcome from any age. Turn off the A148 into Bridge Road (also signed Holt RFC). Turn right into Warren Road (100 yards) then right again into Warren Close (300 yards). (Both are gravel roads.) Kadina is the fourth chalet bungalow on the left. From Sheringham Railway Station: Walk across road to bus stop (outside the tourist information centre). The stop is High Kelling Post Office and hospital. Walk along footpath back towards Cromer and turn left into Bridge Road, then follow the directions above.